You can spew as much B.S. about it as you want (because that’s all I’m going to think of it as: B.S. ), but there is no way I’m going to believe that The Purge should, could, or would be a real law, let alone “work.” That is the main problem with the film, “The Purge.” It’s a really dumb idea to begin with. It goes like this—in order to keep America in great shape and the crime rate at an all-time low, the “New Founding Fathers” (uh-huh) bring forth a social policy that every March 22 for 12 hours, criminal law is put on hold. This is known as The Purge. People can do whatever they want (or as they put it, “release the inner beast”), even murder, without fear of legal consequences. Some go out and let out pent-up anger they’ve held inside for a whole year, while others can hole up safely inside their homes. Apparently, this law was created so people could let out all their inner anger for one night if they go by the honors system not to commit any crimes the rest of the year, thus bringing crime down and making America a more peaceful place. Do I even have to point out how ridiculous this sounds? 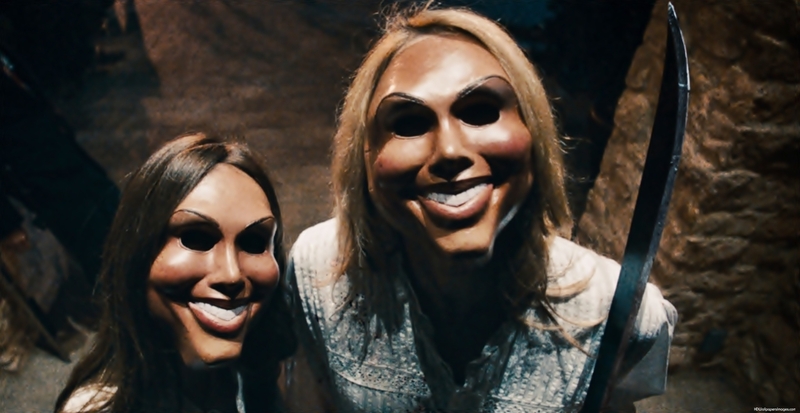 It shouldn’t be much to complain about, since it’s only the setup for a laughable home-invasion thriller; but the characters keep repeating over and over why The Purge exists and why “it works” (and not once are mental scarring brought up in the slightest), and it’s very poorly handled. Even the social commentary (in that the rich attempts to cleanse the world of the poor) is weak. This results in “The Purge” turning out to be a pretentious, deplorable thriller that takes itself way too seriously. The film takes place on March 22, 2022, and right there, you can tell how hard writer/director James DeMonaco is trying to warn his audience that The Purge could exist and it’s the direction America is going. Anyway, we get a couple introductory captions that explain that unemployment is down 1% and crime is abolished, thanks to The Purge. Our main characters are James and Mary Sandin (played by Ethan Hawke and Lena Headey), suburbanites who have made a living thanks to James’ successful security company, which has helped turn all neighborhood homes in fortresses to protect neighbors during The Purge (and the passive-aggressive neighbors resent them for this…for some reason never really explained). Of course, their house has a security system as well, and so they prepare to wait calmly during The Purge with their teenage kids, Charlie (Max Burkholder) and Zoey (Adelaide Kane). But when Charlie notices a homeless man (Edwin Hodge) desperately roaming the neighborhood and screaming for help, he decides to let him in for shelter. (Why did James tell his son the code to disarm the barricades?) James doesn’t trust the stranger, but it turns out the whole family has something more to fear. A group of teenagers wearing masks have been chasing the man down and the creepy Polite Leader (Rhys Wakefield) asks that the family release him or else they’ll break through the barricade and kill them. From what I can gather, these kids are rich and delight in killing poor people during The Purge. And apparently, they want this particular poor person because he got away just as they were about to lynch him. Why they don’t just let him go and look for someone else to kill is anyone’s guess, since they don’t think to take advantage of The Purge, so it’s just a weak excuse to make “The Purge” into a home-invasion flick, which itself isn’t very successful. The homeless man doesn’t have enough moments to be declared a character, but more of a tool to allow James to question morals and ethics. So therefore, it’s hard to be scared by him when he doesn’t pose a threat, and it’s hard to care because James’ morals and ethics are hardly developed anyway. There’s too much behavior and not much rationality so that we’re questioning what’s really at stake while at the same time, we’re being asked to celebrate the deaths of the home invaders as they ultimately force their way in and delight in torturing their would-be victims just so there can be enough time for someone to come in and save them. But then, in the final few minutes, we’re led to believe that the best way to end the mayhem is peacefully. A worthy compromise, but it’s a bit hypocritical. Ethan Hawke at least looks dedicated in his role, playing a man who’s being pushed over the edge (at least, I think that’s what’s happening). Lena Headey, on the other hand, looks like she’d rather be somewhere else, as she doesn’t seem invested in her character. The young actors, Max Burkholder and Adelaide Kane, are fine. Meanwhile, there’s the performance of Rhys Wakefield as the creepy leader of the invaders. I don’t know if he knew what he was acting in was laughably bad, but he can hardly keep a straight face while delivering hammy, supposedly-foreboding speeches. He is the most enjoyable part of the film.